This photo shows a group of 37 people. There are 7 women sitting in the front row; the rest are men. There is a red cross on the building at the back far left of the photo. The inscription on the photograph reads: "Graf Saltikov und sein Stab. Maenner in Uniform sind Mennoniten." 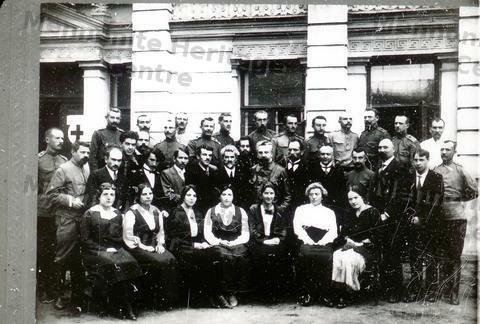 (Count Saltikov with his staff in uniform who are Mennonites(? ).